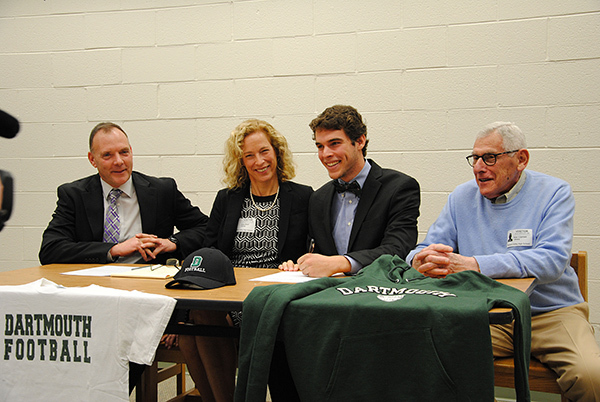 On Wednesday, Feb. 3, Warwick senior Davis Brief signed a National Letter of Intent to play football at Dartmouth College in New Hampshire. 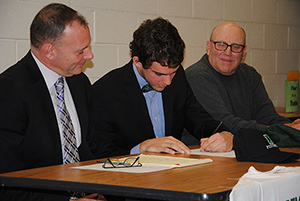 Flanked by Coach and Athletic Director Greg Sirico, his mother and grandfather, WVHS senior Davis Brief signs a National Letter of Intent to play football at Dartmouth College. A member of the prestigious Ivy League, Dartmouth is located in Hanover, New Hampshire, and competes with Harvard, Princeton, Yale, Columbia, Brown, Cornell and others. The football team was a co-Ivy league champion this fall under coach Buddy Teevens, and has won 18 Ivy league titles and one national championship. Davis has played varsity football for the Wildcats as a punter/kicker for five years. During his high school career, he was a two-time East Bay All American and a three-year All-State selection. Davis had a 43-yard average-per-punt this year as a senior—90 percent of his kick-offs were touch backs. He will graduate from Warwick Valley High School as one of the top Wildcat point-scorers (12 field goals, 135 extra points and 171 total points). In fact, Davis Brief is the #2 all-time scorer in the history of Warwick football, going back to 1876! He is expected to compete for the #1 punting position as a freshman at Dartmouth. Also talented academically, Davis is a member of the National Honor Society and is currently ranked 26 in a class of 360, with a weighted average of 98.5. He was a five-time Scholar-Athlete and plays with the WVHS Jazz Band and Wind Ensemble. Davis is the son of Jane and Eric Brief. His brother, Spencer Brief, is a sophomore at High Point University in North Carolina. Congratulations to Davis Brief and his family!